Fresh poultry meat meal (26.5%), maize, corn meal, rice, poultry fat, beet pulp, hydrolysed protein, linseed, fish oil (1%), chicoree powder (1%), brewer’s yeast (dried, incl. 0.05% glucan), powdered egg (dehydrated), potassium chloride, sodium chloride. Raw protein 25.00%, raw fat 15.00%, raw fibres 3.00%, raw ash 6.00%, calcium 1.05%, phosphorous 0.85%, Sodium 0.30%. Nutritional additives: A 12,000IU, D3 1,200IU, E 250mg, B1 2mg, B2 6mg, B6 2mg, B12 40mcg, C 100mg, biotin 180mcg, folate 1mg, Nicotinicacid 18mg, pantothenic acid 16mg, choline chloride 1,100mg, copper (as cupric sulphate, pentahydrate) 10mg, zinc (as zinc sulphate, monohydrate).) 70mg, iodine (as calcium iodide, anhydrous) 2.70mg, selenium (as sodium selenite) 0.18mg. Technological addititives: With antioxidants (tocopherol extracts of natural origin, propyl gallate). Pet food has over a century of tradition with us, to which we feel committed. The Hübers family mill was built in North-Rhine Westphalia as early as 1902, from where it expanded to establish large animal feed plants along the Rhine. The way it began, should also shape the future. In the early nineties, Alwin Hübers founded the IPH Group, a company specialising in pet nutrition. The success proved him right, his products were perfectly tailored to the needs of the animal. In 1993, the Best Choice brand was produced as the first ever European developed premium dog food that we still sell to the present day in 55 countries worldwide. Even at that time the motto was “of the highest quality”. A claim that we still to this day, systematically put into practice. 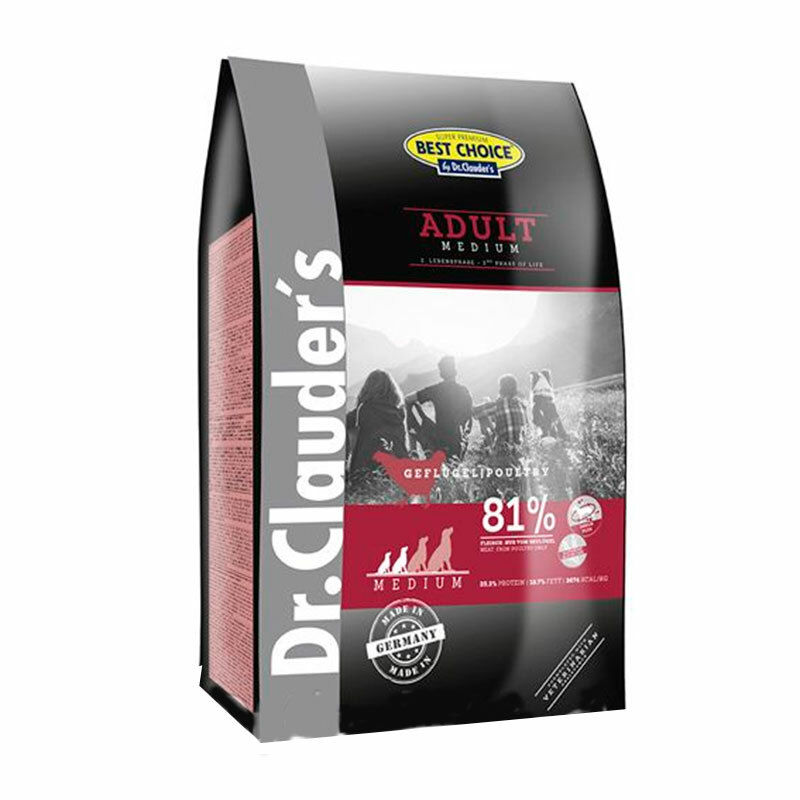 The name Dr.Clauder comes from Dr. Heinz Clauder, a doctoral nutritionist. With his company Dr.Clauder Pet Specialties founded in 1957, he was a pioneer in the field of scientifically developed nutritional supplements that offered the right product for every different life situation of the animal. The 1998 incorporation of the company Dr.Clauder Pet Specialties in the IPH Group continues to be very successful. Expertise in various areas of pet nutrition have now been brought together under one roof and have been constantly expanding ever since. In 2006 Alwin Hübers handed the business over to his son Malte Hübers and the shareholder Alexander Gerards. Finally, in 2010, both companies were merged under the umbrella of the joint brand name Dr.Clauder Solutions for pets. We are proud of our achievements and look simultaneously full of dynamism to the future. Their passion for pets was the driving force of the company’s founders, Dr. Heinz Clauder and Alwin Hübers. For us this means the responsible task to continue with this tradition. Together with our customers and employees, we look forward to it! As a family business, we support the values of morality, trust and respect. Despite the realisation of long-term growth orientation, for us, values form the basis to sound management and sustainable goal achievement. We are proud of the balance of competitive strength with international presence and a history, we are committed to. A look back allows us to look ahead. We have always seen the responsibility to the human as well as to the animal. We encounter the long tradition of pet food within our company, with the aim of absolute quality. This creates a basis for unconditional trust for the customer. This trust lays the foundation stone for our company to have a worldwide presence also in the future with the best products.